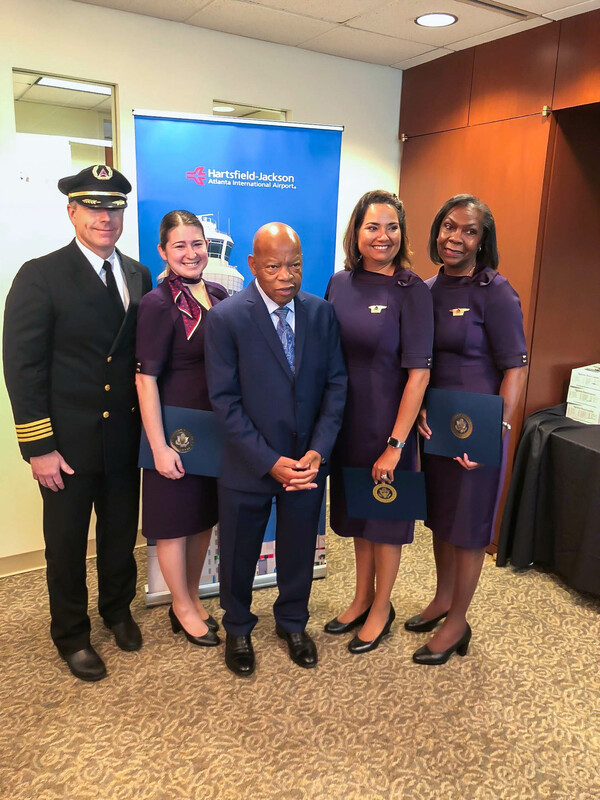 Crew members of Delta Flight 513 received a special thank you from Rep. John Lewis, who awarded them with Congressional Certificates of Appreciation on Wednesday. Lewis was traveling from Detroit to Atlanta on Saturday when he became ill mid-flight, and the flight’s crew and fellow customers quickly jumped into action. The congressman said he is grateful for the assistance he received, and thanked the crew personally at Atlanta’s Hartsfield-Jackson International Airport. The team worked together to ensure the appropriate medical supplies were quickly available and that Captain John Jones, who was also honored with a Certificate of Appreciation, was aware of the situation onboard to ensure medical personnel would be available upon arrival. The crew described Rep. Lewis as a “real trooper” and say he was making jokes once the plane landed. He even tried to walk off the plane, but was advised to wait for medical personnel.